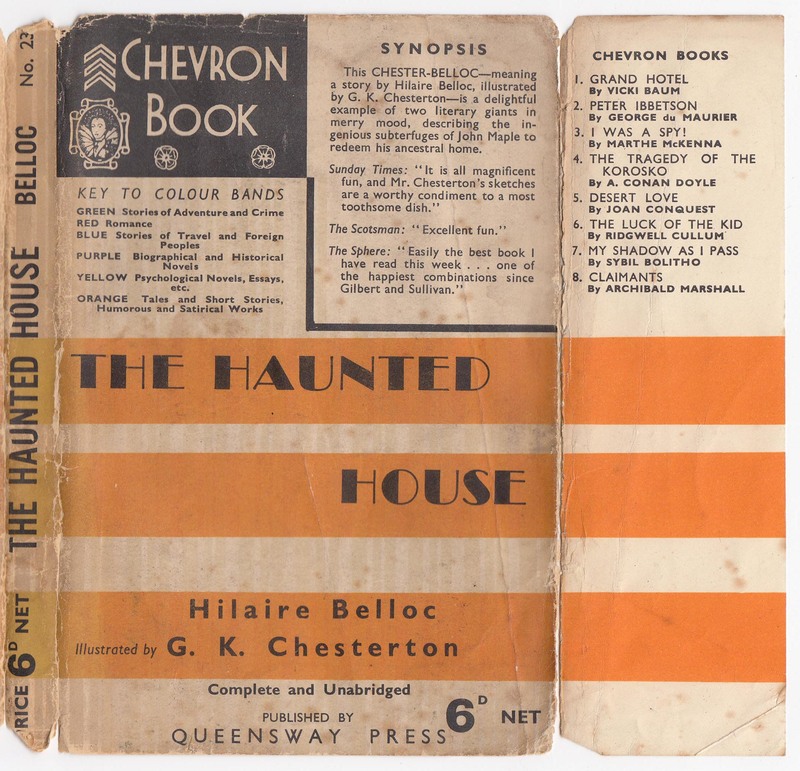 #1 through #24 of the Chevron Books were issued in 1936. According to Paperback Revolution, the acetate covers appeared on the first 18 titles. The acetate covers were then replaced by traditional paper jackets (with printed color bands). Six more titles (#25-#30) were issued in 1937 before the books and jackets were redesigned. Titles #31 to #114 were issued from 1937-1941 as the New Chevron Series. The New Chevron Series books were also 1/4 inch narrower. The Chevron Books and New Chevron Series were the last gasps of the Readers Library Publishing Company, Ltd. established around 1924 by Derwent Hall Caine and Gordon “Ralph” Hall Caine (sons of author Hall Caine) to issue The Readers Library series. Books were manufactured by the Greycaine Book Manufacturing Company founded by Ralph Caine and Frank Grey in 1908 or 1909. The Greycaine Co., (controlled by the Caine brothers and Frank Gray) provided most of the capital for the Reader’s Library. In essence, The Readers Library series was a way to generate work for the book printing firm. The Readers Library books were hardcover, but very cheap and made of low-grade paper and other materials. Millions of copies were sold. The series had often lurid, full color, wrap around illustrations on the jackets, which made them alluring and attractive to buyers. Some, such as Metropolis, demand high prices from collectors (only because of the jackets). The series was also known for its movie tie-ins and was one of the first reprint book series to take advantage of the emerging movie industry. The first movie tie-in book in the Readers Library was the 1924 edition of The Hunchback of Notre Dame, tied to a popular 1923 silent movie). Many of the books published in the series, even if they were not movie editions, were the basis of movies made in the teens and twenties. When Allen Lane (who started Penguin Books) contacted Woolworths about stocking Penguin Books, Woolworth’s buyer said that “Readers Library is a better value. (“The Penguin Story: Sir Allen Lane’s 50 years,” The Times (London), 22 April 1969). Alas, the Readers Library series was greatly diminished by the mid-1930s. In 1934 the Queensway Press imprint was established in London, at 10 Great Queen St., close to the addresses used by the Readers Library Publishing Co. The Queensway Press issued hardcover and paperback reprints in 1934 using series names the Queensway Library and Queensway Classics (which only included Boccaccio’s The Decameron in four paperback volumes). A few other (non-series) books were also issued but the firm’s focus shifted to the Chevron Books. The initial design of the Chevron Books borrowed some elements from the modern, geometric design used by Penguin. However, the design went beyond the simplicity of Penguin books by using the color acetate jackets and littering the jacket and book covers with a significant amount of information, including a key to the color bands, a book synopsis, lists of titles in the series, and author information. As an innovator in book jackets as advertising (with the earlier Readers Library series), the Chevron Books clearly had a design philosophy: Penguin geometry with a barrage of textual advertising for the series. The design, however, did not stick. 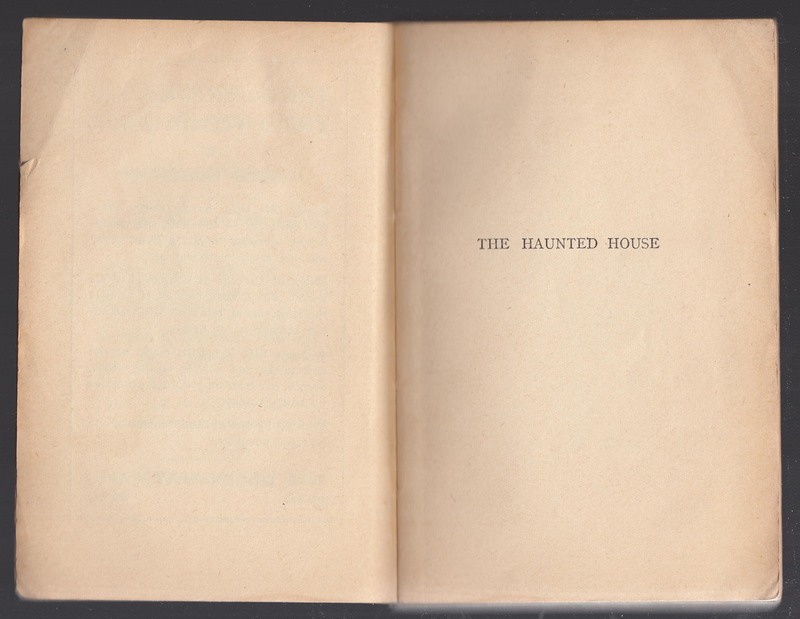 By the 19th title issued in the first year (1936) for the series, the acetate covers were gone, most likely a casualty of cost and fragility out in the bookselling environment. By 1937, the jackets and books were redesigned to align much more closely with the geometric design of Penguin, and the series was renamed in the process. According to Paperback Revolution, the firm went into receivership in 1938. The receiver continued to operate the firm and print books, but no advertisements are evident and the effort seems to be perfunctory at best. 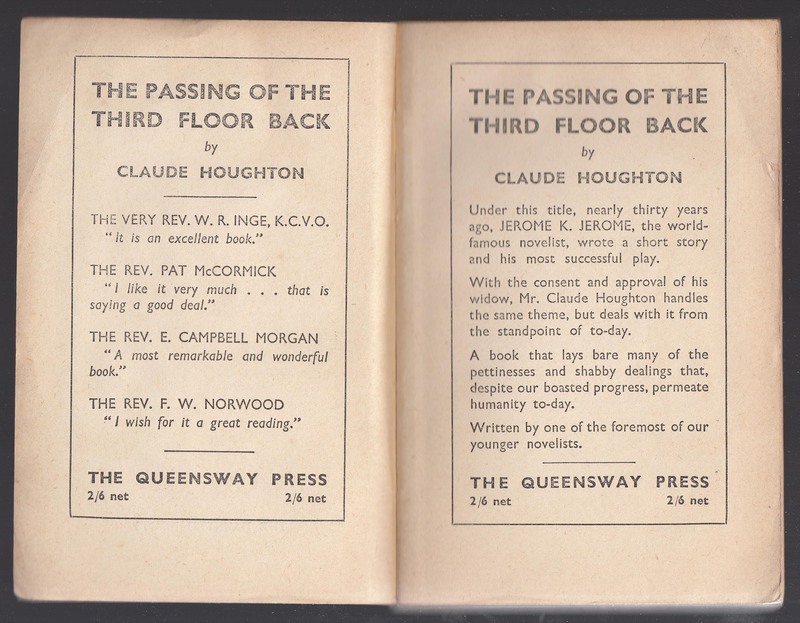 Paperback Revolution indicates that the firm was eventually acquired by the Hutchinson Group and the printing business by Taylor Garnett Evans and Co. Ltd. Hutchinson maintained the Readers Library and Queensway Press imprints until at least the 1950s (source). Some Readers Library and Queensway Press books also appear (sometimes with original artwork) in later Hutchinson paperback series. 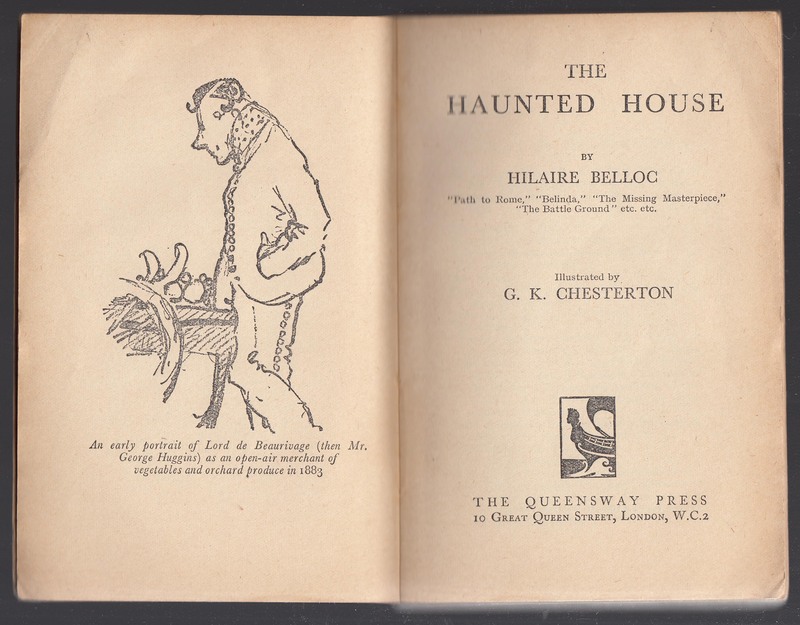 The jacket below is from #23 in the series, The Haunted House by Hilaire Belloc. This title was published in 1937, not long before the series was redesigned and reissued as the New Chevron Series. 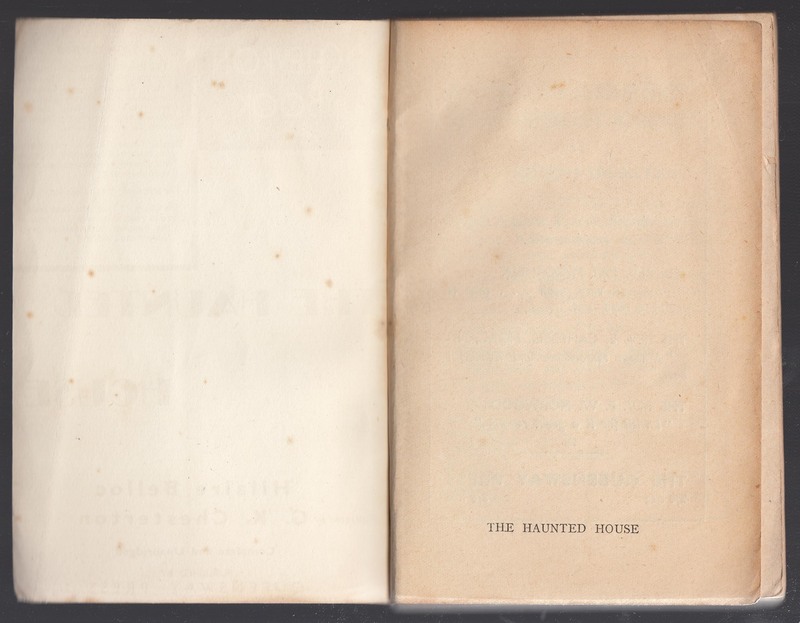 The orange bands on the jacket, below, indicate this title is categorized as “Tales and Short Stories, Humourous and Satirical Works.” The jacket spine includes the series number, title, author and price (6d, net). The jacket front is crowded with information besides the geometric bands. The upper right contains the series name with a chevron above a portrait of the queen. Two flowers are also included (I fail to understand the meaning of the flowers). A list of the “Colour Bands” follows, describing green, red, blue, purple, yellow and orange. Blocked off to the upper right is a synopsis of the book. The title, author, and illustrator (author G.K. Chesterton in this case) are followed by “Complete and Unabridged” the publisher, and price. The front jacket flap lists Chevron Books #1 through #8. The colored bands continue from the front of the jacket. 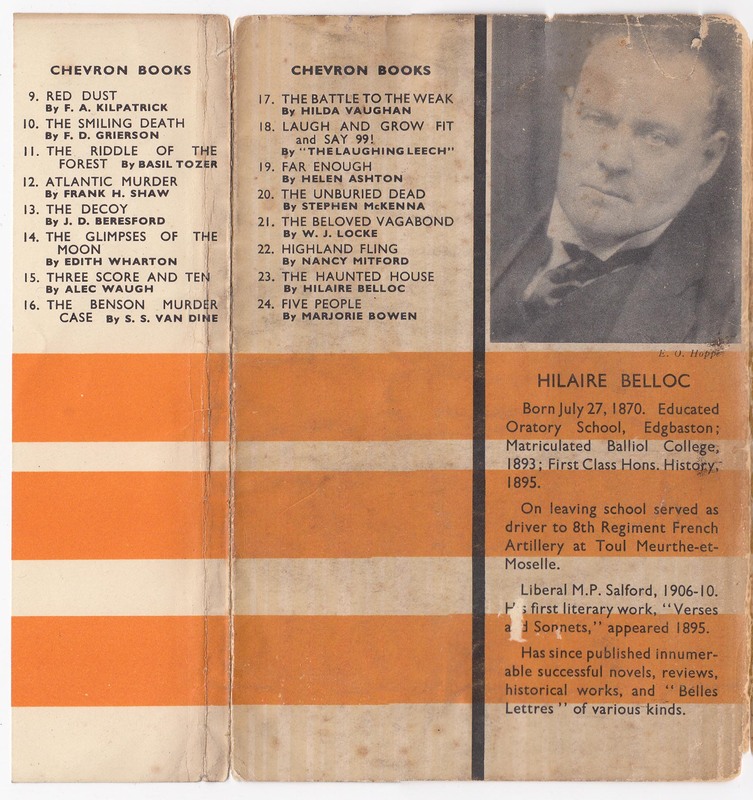 The rear jacket flap contains Chevron Books #9 through #16. The back of the jacket #17 through #24. A portrait of Belloc and brief bio fill the left half of the back of the jacket. The book cover contains much of the information contained on the jackets. The spine is identical. The front of the book does not contain the color bands nor description of the six color categories. The back of the book places the 24 titles in one list to the left of the author biography. A list of books published in the Chevron Books series. This is a modified version of the list at Brass Penguin. I added full author names and the year of publication and fixed some typos. 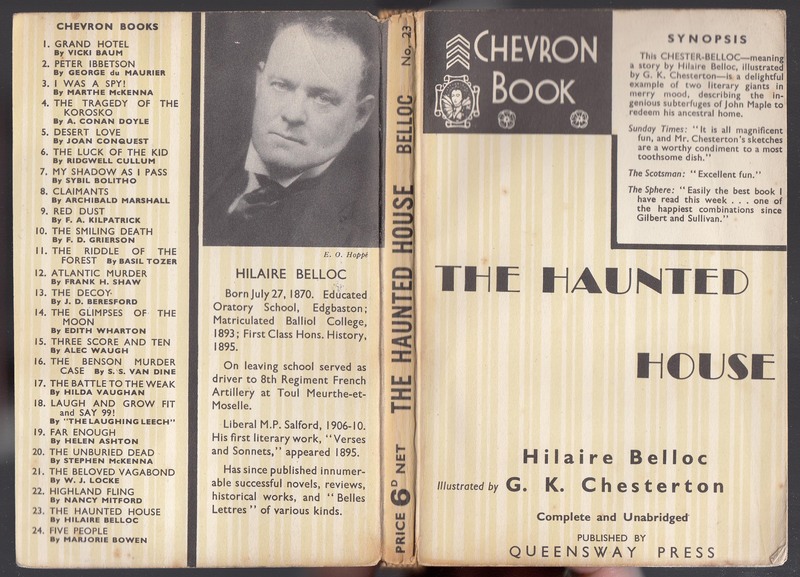 The series continues as the New Chevron Series, from #31: Marie Belloc Lowndes, The Lonely House (1937) to at least #114. Wallace Ellison, Escapes and Adventures (1941, with a Readers Library Pub. Co. imprint). Continuing with the slight oddness of the series is a first half-title page, with the title near the bottom of the page. I can’t say I recall seeing another book with this placement of the title on the half-title page. Following the half-title page are advertisements for a few additional Queensway Press titles. 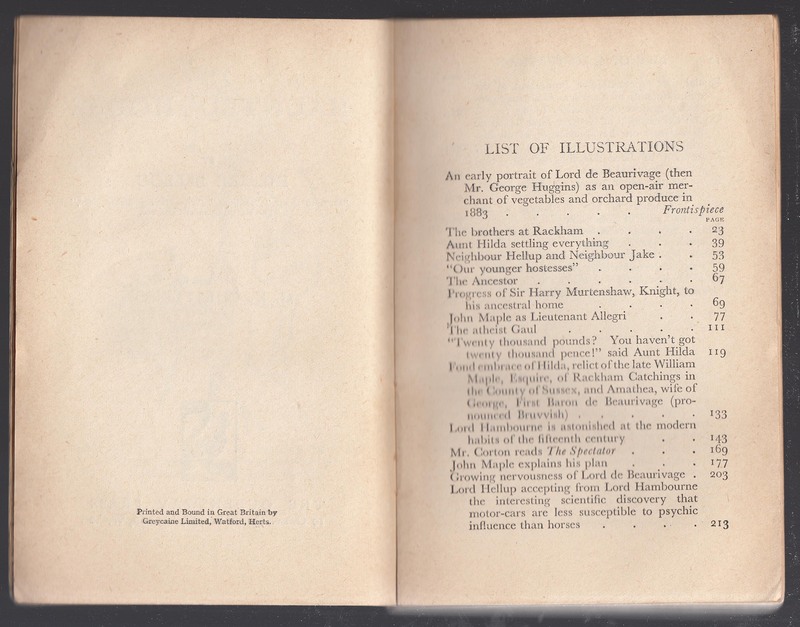 An illustration from the book faces the title page. A publisher colophon (a ship’s bow) is included.